Do You Want to Know More About Who You Are, and Why You’re Here? • Who am I, and what am I doing here? • Why is it so hard to fit into the world? • Why do I see the world the way I do? • How can people believe and act so differently from me? If you answered YES to any of these questions, then scroll down and download now your free chapter from THE INSTRUCTION: Living the Life Your Soul Intended, by Ainslie MacLeod, and gain free access to Ainslie’s inspirational video series, Insights from the Spirit Guides! Are You Searching for Deeper Spiritual Meaning in Your Life? After you download the free chapter, you’ll be introduced to the concept of soul ages, and learn about the 10 different soul levels that all humans journey through during their many lifetimes here on earth. You’ll also learn about the belief systems that each soul age embodies. Plus you’ll gain access to Ainslie’s inspirational video series, Insights from the Spirit Guides! Understanding more about your soul’s age, and those of the people around you, will help you to begin making sense of the world in a new and empowering way! Are you ready to begin your journey of self-knowledge, and living the life your soul intended? 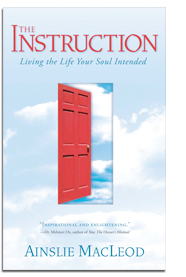 Enter your name and email address above to download your free chapter of THE INSTRUCTION: Living the Life Your Soul Intended, gain FREE ACCESS to Ainslie’s inspirational video series, Insights from the Spirit Guides, and take your soul type quiz! Ainslie MacLeod is an internationally acclaimed psychic, and award-winning author of THE INSTRUCTION: Living the Life Your Soul Intended (Sounds True, 2007) and THE TRANSFORMATION: Healing Past Lives to Realize Your Soul’s Potential (Sounds True, 2010). Ainslie has been a featured guest on Oprah’s Soul Series. He is a faculty member at Kripalu, Hollyhock, and the Omega Institute. His mission is to explore past lives to reveal your life’s purpose. Ainslie’s explorations into the soul and its impact on human beliefs and behavior have led him to develop a unique method for identifying and overcoming the fears, blocks, and limiting beliefs that stem from past lives. The SoulWorld® Program, a Private Sanctuary for Spiritual Seekers, was created specially for those interested in developing a deeper awareness of their soul’s purpose, and having regular access to Ainslie and his Spirit Guides. Growing up in Aberdeen, Scotland, Ainslie never recognized his psychic abilities. As a rationalist, he dismissed his many encounters with ghosts, spirits, and precognition as déjà-vu, or did his best to ignore them. It wasn’t until he experienced two significant events in his later life that he began to accept his destiny. The first was that he ended up in California as predicted by a psychic, many years earlier. The second occurred in Hawaii, when he encountered his deceased uncle in a bookshop. His uncle encouraged him to accept the path that would lead him to become a professional psychic. Ainslie’s area of expertise is in matters of the soul, life purpose, and past lives. He gave up a career as a successful illustrator to devote his life to helping others to find happiness and fulfillment by living the life their soul intended. Ainslie stresses that his work is all about helping those who are serious about transforming their lives. He is not a fortune-teller, a medium, or a therapist. With the support of his Spirit Guides, his purpose is to explore past lives to reveal your life’s purpose. Author and O Magazine contributor, Martha Beck, says, “Ainslie truly changed the course of my life!” Since becoming a “no-longer-reluctant” psychic, Ainslie has helped thousands of people find their path, heal fears, phobias, and limiting beliefs, and has guided his clients to overcome blocks to fertility, find their soul mate, leave toxic relationships, end self-sabotaging behavior, and transform their life in many other ways. 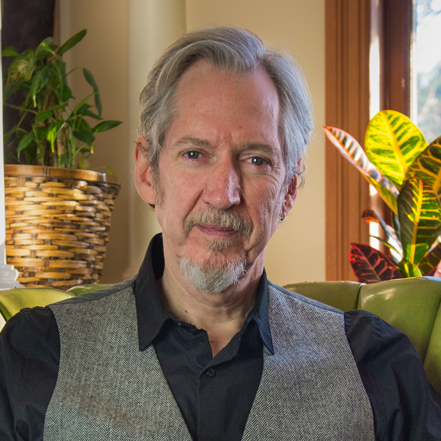 Ainslie lives in the beautiful Pacific Northwest where, from his office on a tranquil island, he and his Spirit Guides offer psychic guidance through coaching and membership programs to clients worldwide. Did you already sign up? Get your FREE chapter from THE INSTRUCTION now!